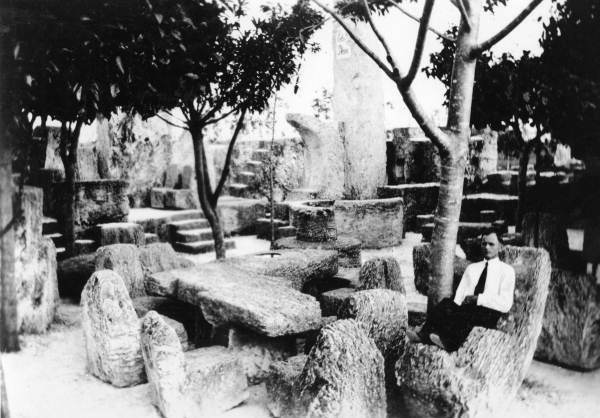 Edward Leedskalnin at his Coral Castle. Ed standing near his polar star telescope. Edward Leedskalnin (1887-1952) was a kind and gentle immigrant from Latvia who only had a fourth grade education. Yet, he was brilliant. 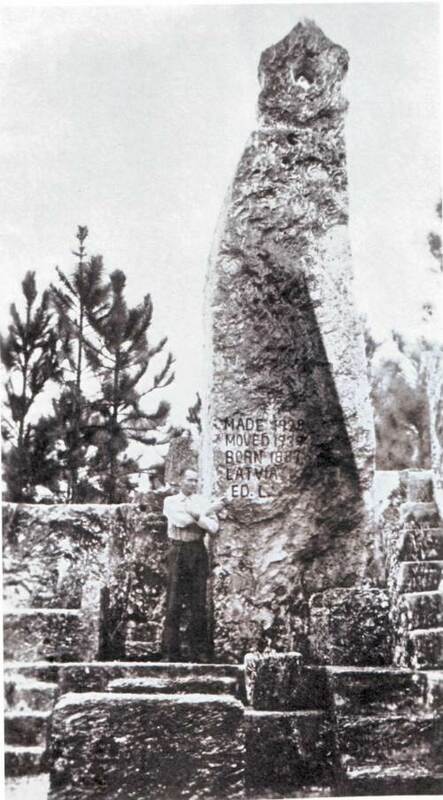 Ed was a skilled electrical engineer who had done extensive experimentation with electro-magnetism. He generated his own electricity and was happy to demonstrate his equipment to his neighbours. 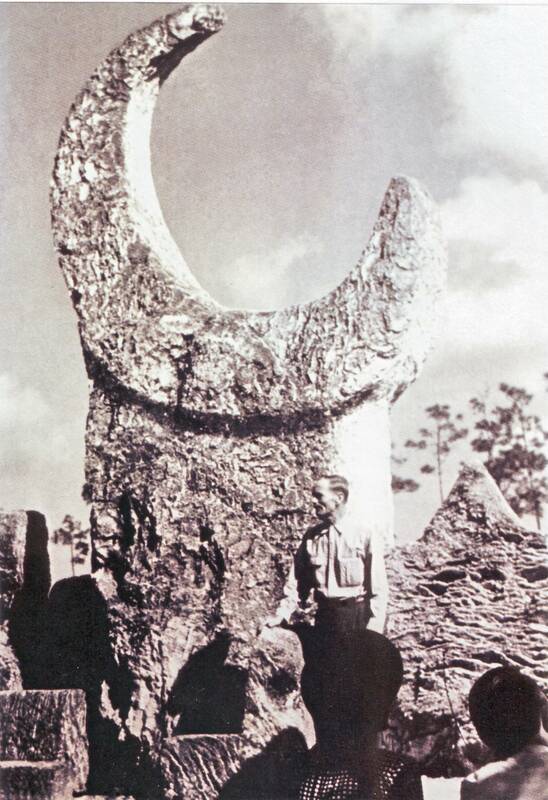 Edward Leedskalnin would go so far as stating that he could see beads of light on objects that he said were the physical presence of nature’s magnetism. He explained that scientists have incorrect knowledge of atomic structure and electricity. Edward Leedskalnin, wrote and published five works. “A Book in Every Home” which contains Ed’s thoughts on 3 subjects – Sweet Sixteen, Domestic and Political Views. He wrote 3 booklets on “Magnetic Current” and his “Mineral, Vegetable and Animal Life” contains his beliefs on life’s cycle. He also published an advertisement. In Magnetic Current and complimentary writings, Leedskalnin provides instruction through experimentation and lecture into the interactions of the individual North and South pole magnet, a magnetic unipole. Since the individual North and South pole magnets are considered by Leedskalnin to be the base of everything, he is able to move in and out of seemingly unrelated scientific topics with ease drawing awakening correlations between them and shedding light on the true inner workings of our world and universe. Ed giving lectures about astronomy. Ed teaches new understandings into many topics: atomic structure, biology, geology, astronomy, physics, x-rays, alpha, beta, gamma-rays, chromosomes, radium, uranium, gravity, life, death, earthquakes, perpetual motion, radio waves, acid, sensory perception, chemistry, digestion, photosynthesis, radiation, neutral particles of matter, lightning, radar waves, thought, etc. Leedskalnin reveals the inner-workings of our magnetic universe and inter-connectivity of all things by teaching readers how to teach themselves a better scientific method for a more sound universal scientific base understanding. A sense of truth can be felt behind his every word. “The difference between the rubber magnet and the steel magnet is that the magnet in the rubber comes from the magnets that hold together the rubber, and both North and South poles are in the same side of the rubber and the magnet poles are small and there are many of them close together, but in the steel bar the attracting magnet is not the magnet that holds together the steel, but the surplus magnets, the circulating magnet that was put in it. “Attract the iron filings with the rubber magnet, then approach with the steel magnet. 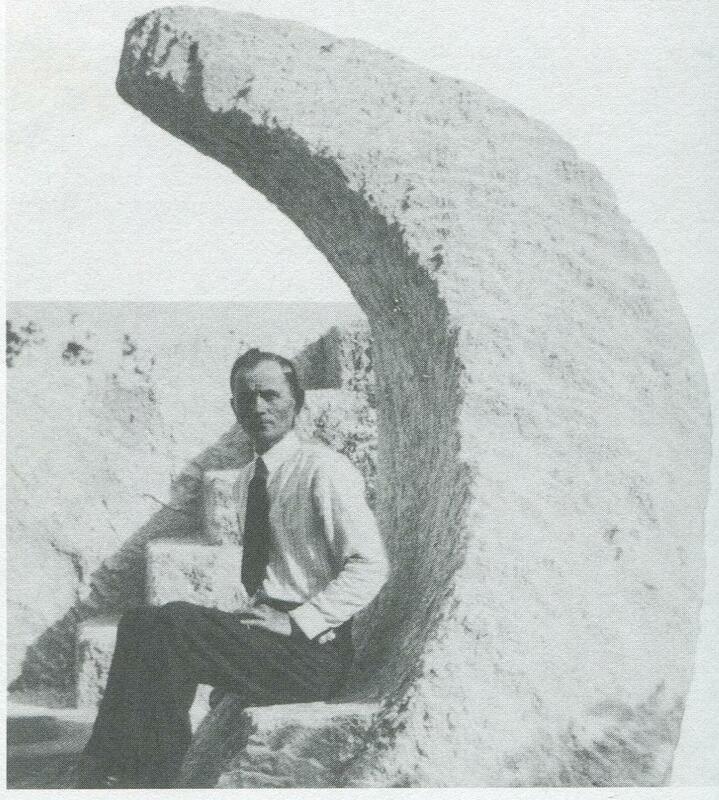 Leedskalnin got lucky, his works have emerged as two of the world’s most mysterious creations. His book, Magnetic Current, is a detailed experimentation manual for researchers interested in learning how to become real scientists through direct experimentation and refined results interpretation methodology. 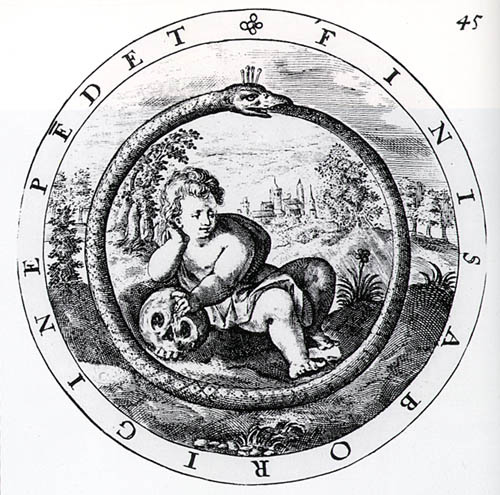 In his original writings, Leedskalnin substituted portions of his normal text with Greek letters and odd symbols. This fascinating cryptology is mesmerizing to decoders. But why is this true? What process is causing knowledge to be passed along incorrectly? He says some books are good now but they wont be 25 years from now. It really a pretty sobering thing to ponder, lol.